WD Surveillance Storage is built for 24/7, always-on, high-definition surveillance security systems that use up to eight hard drives and up to 32 cameras. The smart choice for surveillance - WD Surveillance Storage offers exclusive AllFrame technology to bring you premium reliability and peace-of-mind when installing your home or small to medium business security system. Exclusive firmware upgrades work with ATA streaming to reduce error pixilation and video interruptions that occur when desktop hard drives are incorrectly used as storage in security systems. 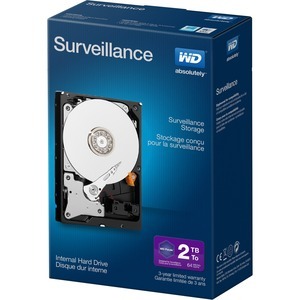 WD Surveillance Storage is built for 24/7, always-on, high-definition surveillance security systems that use up to eight hard drives and up to 32 cameras.